2014 Event T-Shirt, design by Bwanadevil, hand screen printed on a 100% USA cotton shirt, limited numbers $30 plus p&h. 2014 Event decal, design by Bwanadevil, screen printed, not digital, limited numbers $5 plus p&h. 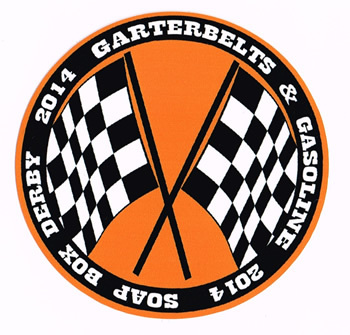 GarterBelts & Gasoline official soap box derby decal, screen printed on vinyl, only 50 produced $5 plus p&h . 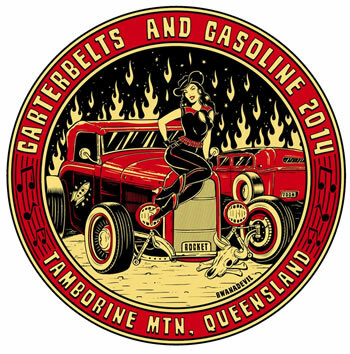 2012 Event DVD - Almost 60 minutes of quality footage showcasing one of Australia’s premier nostalgia festivals. Produced by 3HAB productions, co-founded by hot rodder and professional photographic journalist Dale Haberfield.